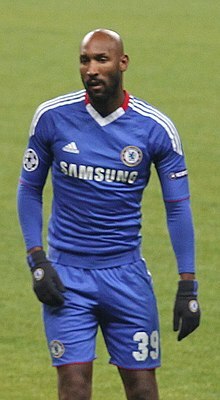 نیکولا آنلکا (اینگیلیسجه: Nicolas Anelka) (دوْغوم:۱۴ مارس ۱۹۷۹(1979-03-14) ‏(۴۰ یاش) لو شزنه) کئچمیشده بیر فوتبالیست و ایندیلیکده بیر مربی اوْلاراق چالیشیر. فرانسه میلّی تیمی ترکیبینده چیخیش ائدیب و هوجومچو موقعیتینده اوْیناییب. فیفا دونیا کاپی ۲۰۱۰ اوْیونلاریندا مئیدانا گئدیب. ↑ Includes Trophée des champions, UEFA Super Cup, Community Shield (1998, 2009, 2010), Supercopa de España, FIFA Club World Cup (2000), Süper Kupa, Chinese Super Cup and Supercoppa Italiana. A Includes one appearance and one goal from the match against FIFA XI on 16 August 2000 which فیفا and the French Football Federation count as an official friendly match. ↑ FIFA World Cup South Africa 2010 – List of Players (PDF). Fédération Internationale de Football Association (FIFA). یوْخلانیلیب5 June 2013. ↑ Player Profiles. وست برومویچ آلبیون. آرشیولنیب اصلی نۆسخه‌دن on 25 December 2013. ↑ "INF, formateur de talents" (in French). FFF. Archived from the original on 14 November 2012. Retrieved 21 July 2009. ↑ Pla Diaz, Emilio (23 July 2006) "Zinedine Zidane – Century of International Appearances". Rec.Sport.Soccer Statistics Foundation. Retrieved 2 January 2012. قارداش پروژه‌لرده نیکولا آنلکا گؤره داها آرتیق بیلگی‌لر تاپابیلرسینیز. بۇ صفحه‌‌ سوْن دفعه ‏۲۳ فوریه ۲۰۱۹، ‏۲۳:۳۲ تاریخینده دَییشدیریلمیشدیر.